If the symptoms do not necessitate immediate medical attention (see above), you can treat many of the symptoms at home. In order to keep the blood from draining down your throat, you should sit down, lean your head forward, and breath through your mouth. 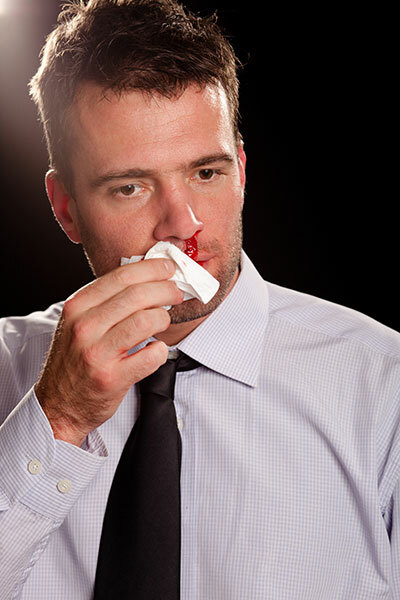 If the bleeding is not accompanied by pain, you can gently apply pressure to the soft part of your nose for about 10 minutes. If you cannot stop the bleeding, seek immediate medical attention! Wrap a cold compress or ice in a washcloth and apply it to your nose for 10 to 15 minutes to reduce pain and swelling. You can repeat this up to four times per day. If your nose is not bleeding, elevate your head to reduce pain. You can take acetaminophen (Tylenol) to treat the pain; read and follow the instructions on the label. You should not take nonsteroidal anti-inflammatory drugs (NSAIDs) like ibuprofen (Advil) or aspirin for at least 48 hours after a nose injury. A broken nose will most likely heal without any problems. However, some people are unhappy with the way their nose looks after it has healed or they may have difficulty breathing normally. If either of these circumstances occurs, a reconstructive nose surgery, known as rhinoplasty can be performed.